Epithelial tissues are thin tissues that cover all the exposed surfaces of the body. They form the external skin, the inner lining of the mouth, digestive tract, secretory glands, the lining of hollow parts of every organ such as the heart, lungs, eyes, ears, the urogenital tract, as well as the ventricular system of the brain and central canals of the spinal cord. The cells making up epithelia are often closely bound to one another through specialized structures called tight junctions. They are also free from blood vessels and nerves and are supported by a connective tissue called the basement membrane. They have polarity with a distinct basal domain facing the basement membrane and the other apical surface facing the lumen of an organ or the external environment. Epithelial tissue has a number of functions, which include protection against abrasion, radiation damage, chemical stress and invasion by pathogens. A single organ can have different types of epithelial tissue based on the substances to which different surfaces are exposed. Protective tissue tends to be thicker, made of multiple layers of cells and often has inclusions such as keratin to provide mechanical strength and resistance. The skin of most mammals contains layers of thick keratinized dead epithelial cells protecting them against water loss and other stresses. Similarly, the esophagus is also exposed to a wide range of different textures, pH levels and chemical compositions from food and drink. Therefore, it also contains protective epithelium. Due to its involvement in the digestive process, however, it remains non-keratinized, and secretes mucus to smoothen the passage of food. Alternatively, epithelial tissue can be involved in absorption, secretion and movement of substances. These epithelia are usually thin, containing cilia or microvilli and are often made of one layer of cells. With the exception of the mouth and esophagus, the rest of digestive tract consisting of the stomach, small and large intestine is covered by these kinds of thin epithelia. These cells secrete enzymes and play an important role in selectively absorbing digested food. The small intestine is particularly noted for the presence of microvilli on the epithelium that increase the surface area for absorption. Epithelia in bronchioles of the lungs contain cilia that move mucus and improve immune function. Similar ciliated epithelia in the fallopian tubes move the egg from the ovaries towards the uterus. Some tissues, such as transitional epithelia, have a specialized structure that allows them to stretch and expand the capacity of the organ. Transitional epithelia are found lining the urinary bladder as well as the ureters and urethra. Small numbers of these cells are found in the urine, as part of the normal sloughing of dead cells. However the presence of a large number of cells from the transitional epithelium or from epithelial cells in the kidney indicate urinary tract infection, high cholesterol, diabetes or kidney disease. There are different types of epithelial tissue depending on their function in a particular location. The simplest classification of these tissues is based on the number of cell layers. When the epithelium is composed of a single layer of cells, it is called simple epithelial tissue and those containing two or more layers of cells are called stratified epithelial tissues. One particular type is called pseudostratified because a single layer of cells having varying heights gives the appearance of being stratified. The number of cell layers and cell types together give rise to 6 different types of epithelial tissue. Additionally, there are pseudostratified epithelia and transitional epithelia. Simple epithelia are made of a single layer of cells that are in direct contact with the basement membrane with a common apical surface. These cells can be squamous, cuboidal, or columnar. Simple squamous epithelium is found in the alveoli of lungs, and its structure is important for the exchange of gases between the blood and lungs. Simple cuboidal epithelia line the lumen of collecting ducts in the kidney and are present in the thyroid around the follicles that secrete thyroid hormones. They protect the underlying structures and have a secretory function (such as in the thyroid) or absorptive function (as in the collecting ducts of the kidney). 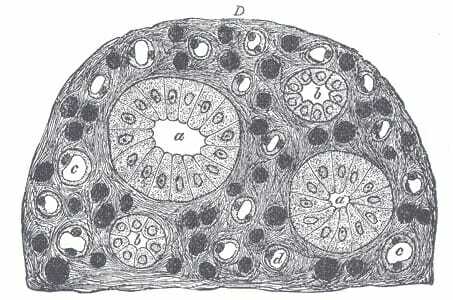 The image shows a transverse section of a kidney and the letters ‘a’ and ‘b’ demarcate the lumen of collecting ducts. Simple cuboidal epithelia line both those structures. Simple columnar epithelia are found in the female reproductive system and in the digestive tract. The cells in the fallopian tubes are ciliated and involved in the movement of the ovum towards the uterus. Those in the digestive tract are non-ciliated, and instead contain microvilli, which gives the epithelium the appearance of being brush-bordered. Pseudostratified epithelia are formed of cells that have varying heights and therefore present the illusion of being stratified. However, every cell in this tissue makes contact with the basement membrane, thereby placing it among the simple epithelia. Stratified epithelia consist of more than one layer of cells and only one layer is in direct contact with the basement membrane. Similarly, only one layer of cells has the apical surface exposed to the lumen of the organ or to the external environment. These tissues often have a protective role, and the extent of friction or abrasion often determines the number of layers of cells. Stratified squamous epithelia are found in skin, with many dead, keratinized cells providing protection against water and nutrient loss. Stratified cuboidal epithelia are found surrounding the ducts of many glands, including mammary glands in the breast and salivary glands in the mouth. Stratified columnar epithelia are rare, found predominantly in some organs of the reproductive system, and in the conjunctiva of the eye. Transitional epithelia are a special subset of stratified epithelia that consist of ovoid cells that can stretch based on the pressure of liquids inside the organ. They are exclusively found in the excretory system. Epithelial tissues play the role of separating two structures from each other. For instance, the epithelium in a blood vessel demarcates the cells of the blood from those forming the artery or vein. This allows two organs to remain in close proximity for their function while maintaining separate internal physiology. In order to accomplish this function, however, epithelial tissues need to be tightly attached to each other, forming a mostly impenetrable layer. This is achieved by the presence of tight junctions between two epithelial cells. Tight junctions in cells are also known as occluding junctions because they prevent the flow of material through the interstitial space between two cells. These are structures formed from the close interaction between the extracellular domains of two sets of transmembrane proteins. These proteins are arranged in a row near the apical surface of epithelial cells and are predominantly made of claudins and occludins. Epithelial tissue rests on a structure called the basement membrane. It consists of two parts – the basal lamina and the reticular connective tissue underneath. The basal lamina is secreted by the cells of the epithelial tissue itself and contains proteins, glycoproteins, and collagen IV, a type of structural protein that forms sheets. The basement membrane compensates for the lack of blood vessels and nerves in the epithelium and is important for transport of nutrients, clearance of waste products, and transmission of neural and hormonal signals. It also plays an important role in anchoring the epithelium to the connective tissue underneath. Apical Surface – Part of the cell membrane of epithelial cells that faces the lumen. Differing in composition from the rest of the cell, it often contains cilia or microvilli and many specialized proteins. Cilia – Slender, cytoplasmic extrusions present in nearly every mammalian cell. Some are motile cilia that are involved in the movement of substances. Lumen – Inner space of tubular structures such as ducts or the respiratory and gastrointestinal passages. Microvilli – Large number of minute projections seen from the plasma membrane of some cells, designed to increase the surface area of the cell for secretion or absorption. 1. Which of these epithelia can stretch to increase the volume of the organ based on internal water pressure? C is correct. Transitional epithelia present in the excretory system, lining the ureters, urethra and urinary bladder can stretch depending on the volume of urine. Simple squamous epithelia are present where there is absorption or movement of materials. Simple and stratified columnar epithelia usually have a secretory function. 2. How is a pseudostratified epithelium different from a truly stratified tissue? A. The nuclei are at the same level in pseudostratified epithelia. B. The apical and basal surfaces are aligned. C. There are multiple cell layers in pseudostratified epithelia. 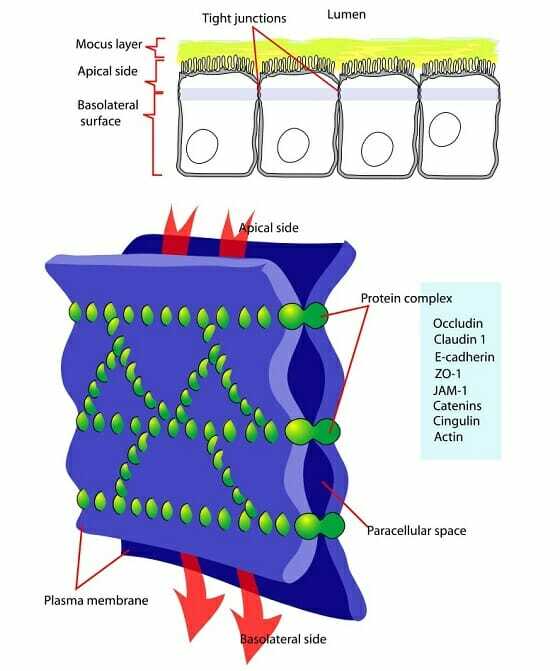 D. All the cells in a pseudostratified epithelium interact with the basement membrane. D is correct. 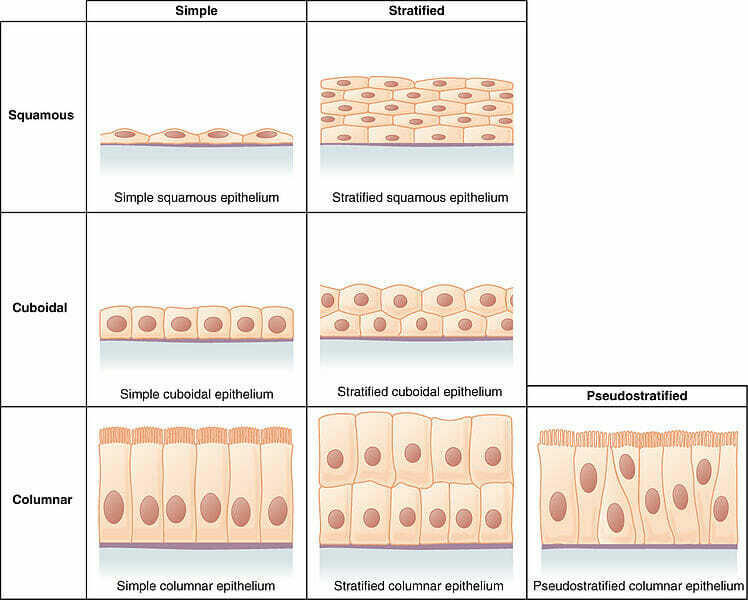 Since all the cells of a pseudostratified epithelium rest on the basement membrane, they are classified as a simple epithelial tissue, rather than as a stratified epithelium. Their nuclei are often at different levels, their apical surfaces are not aligned with each other and consist of a single layer of cells. 3. Which of these is an important function of epithelial cells? D is correct. Epithelia have a number of functions, including protection, secretion and absorption. They demarcate different surfaces from each other, and resist friction, invasion by pathogens, loss of water and nutrients in addition to enhancing the functions of various organs.